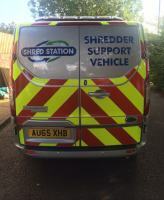 A recent addition to our shredding fleet is the new shredding support vehicle. We wrote previously about the benefits of a large mobile shredding fleet, adding a support vehicle enhances the benefits beyond this by maintaining the shredding services offered with a large fleet. The shredding support vehicle enables us to service and support both our mobile shredding fleet and our static depot shredding equipment. Enhancing our fleet with this support vehicle ensures the shredding services we provide are as reliable as possible and surpass any other shredding provider. Call us today to speak to a shredding specialist regarding your requirements.